BURLINGTON, Ontario – In recognition of IDAHOT last Thursday (17 May 2018), IKEA Canada raised the Pride flag at each of its stores from coast to coast, symbolising the organisation’s commitment to an inclusive work environment which stands up for the rights of lesbian, gay, bisexual, transgender, and people of all sexual orientations and gender identities. IDAHOT is the acronym for International Day against Homophobia, Transphobia and Biphobia. 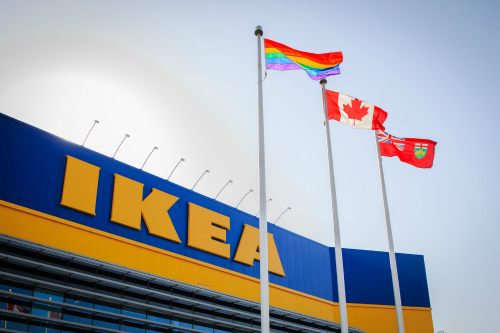 To further foster inclusivity, IKEA Canada announced a new partnership with Pride at Work Canada, a Toronto-based organisation whose vision is a nation where LGBT+ people can achieve their full potential at work. It seeks partnerships with employers to provide services to foster workplace cultures that recognize LGBT+ employees as an important part of a diverse and effective workforce. This partnership is in addition to IKEA’s longstanding and ongoing partnership with Workplace Pride. A wholly-owned subsidiary of the IKEA Group that is headquartered in the Netherlands, IKEA Canada has 13 stores, an e-commerce virtual store, six pick-up and order points and 14 collection points across the country. It announced plans to open new stores in Quebec City and London, Ontario. Last year, it welcomed 28 million visitors to its stores and 95 million visitors to its web site.